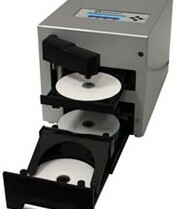 Microboards presents the industry's most space-efficient automated disc duplicator! Measuring in at just 9" high and 16" wide, the QDL-1000 Quic Disc Loader is the easiest way to automatically duplicate up to 25 discs at a time. The QDL's reliable, robotic arm picks up discs from the lower tray, lifts them to the recording drive, and deposits finished CDs and DVDs in the output tray, ready for use. Try printing labels using a Microboards disc printer for a fully-finished product. Perfect for the small business, office, or home, the QDL-1000 copies discs automatically, unattended, at a very affordable price. Need a handful of copies on the go and don't want to waste system resources by recording on your computer? The QDL burns DVDs at 20X and CDs at 40X, and is completey standalone. Simply insert a master disc and blanks, and the QDL does the rest. Blu-ray and LightScribe versions available by special order. This page was updated Friday, July 24, 2009 at 9:16am by Microboards Marketing Department.